There are many skin tag removal methods available such as home remedies like tying the tag with a piece of string, treatments involving liquid nitrogen or surgical removal by a doctor. 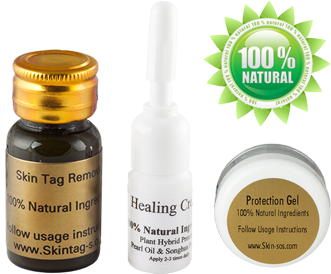 If you are looking for a painless, quick, easy, 100% natural & scar free way to remove your skin tags then this product is the right one for you! The best way to decide if you want to use a product, especially one that involves your skin is to see the results for yourself. We have filmed the whole skin tag removal process from start to finish for this very reason. We think you will agree that the final results are fantastic! Before I found your cream I had a couple of skin tags removed from my face using liquid nitrogen which resulted in a nasty burn and a scar. Never again, I wish I found your product sooner. I've treated 3 skin tags so far with excellent results.